"The murder was planned, deliberately and at obvious risk, to take place bang in the middle of a private performance of Hamlet. Behind the scenes there were thirty-one suspects. In the select and distinguished audience twenty-seven. 'Suspicions' said Appleby, 'crowd thick and fast upon us.' "
I read the first 50 odd pages and was on the verge of discarding this but as it's written in four parts- Prologue, Development, Denouement and Epilogue, I decided to hang in until Part 2. I'm glad I did as the story picked up from there until a very good ending. 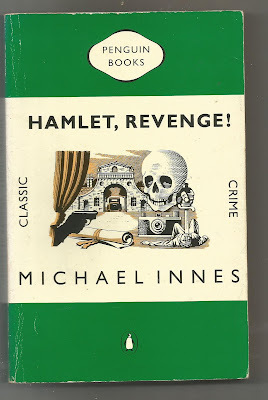 The trouble I found with Part 1 was that it is 99.9% about the setting up of this private 'Hamlet' performance at a grand country estate, Having virtually no knowledge of anything Shakespearean the entire 75 pages was a struggle until as stated Part 2, where it becomes a standard 'who dunnit'. Innes has created a good 'Inspector' with Mr Appleby who goes about his work with some humour and a lot of patience. The second niggle however is the 'cast of thousands' that are suspect. Even though the story is set in a castle bigger than Blenheim Palace thirty odd suspects is a bit many and gives the author the chance to pad the tale out with speculation. This has a very good ending, with all the information in the story as how the crime is committed; the reader just has to pay attention keeping track of the movements of several dozen people. Again, these English country estates are lethal, hardly a weekend seems to go by without a murder or two at one. Michael Innes was the pseudonym of J.I.M. Stewart an academic of some note the author of several novels and biographies under his real name and the 'Appleby' crime series under this assumed name.